The Great Sham Battle Which Puts Buffalo Bill in the Shade. Rifle Shooting and Other Features Attract Large Crowds to the International Encampment. Massachusetts Carries Off the Honors of the Day—The Score in Detail—Camp Notes. The day at the encampment was what might be classed as a red-letter day, because it was one of the few days when anything like a fair attendance was had. 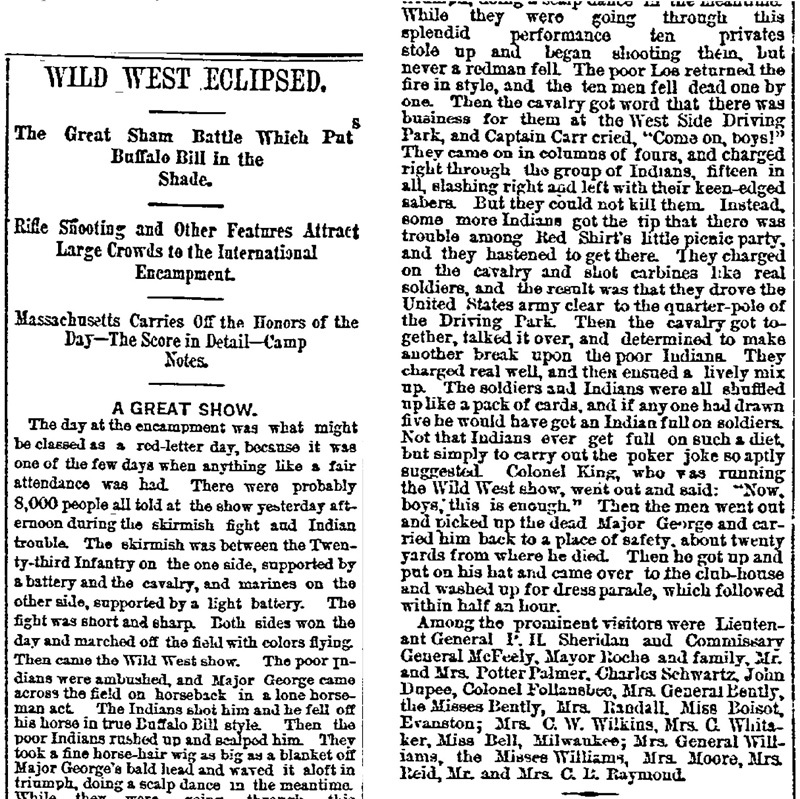 There were probably 8,000 people all told at the show yesterday afternoon during the skirmish fight and Indian trouble. The skirmish was between the Twenty-third Infantry on the one side, supported by a battery and the cavalry, and marines on the other side, supported by a light battery. The fight was short and sharp. Both sides won the day and marched off the field with colors flying. 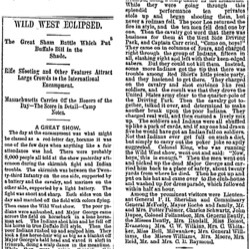 Then came the Wild West show. The poor Indians were ambushed, and Major George came across the field on horseback in a long horseman act. The Indians shot him and he fell off his horse in true Buffalo Bill style. Then the poor Indians rushed up and scalped him. They took a fine horse-hair wig as big as a blanket off Major George's bald head and waved it aloft in triumph, doing a scalp dance in the meantime. While they were going through this splendid performance ten privates stole up and began shooting them, but never a redman fell. The poor Los returned the fire in style, and the ten men fell dead one by one. Then the cavalry god word that there was business for them at the West Side Driving Part, and Captain Carr cried, "Come on, boys!" They came on in columns of fours, and charged right through the group of Indians, fifteen in all, slashing right and left with their keen-edged sabers. But they could not kill them. Instead, some more Indians got the tip that there was trouble among Red Shirt's little picnic party, and they hastened to get there. They charged on the cavalry and shot carbines like real soldiers, and the result was that they drove the United States army clear to the quarter-pole of the Driving Park. Then the cavalry got together, talked it over, and determined to make another break upon the poor Indians. They charged real well, and then ensued a lively mix up. The soldiers and Indians were all shuffled up like a pack of cards, and if any one had drawn five he would have got an Indian full on soldiers. Not that Indians ever get full on such a diet, but simply to carry out the poker joke so aptly suggested. Colonel King, who was running the Wild West show, went out and said: "Now, boys, this is enough." Then the men went out and picked up the dead Major George and carried him back to a place of safety, about twenty yards from where he died. Then he got up and put on his hat and came over to the club-house and washed up for dress parade, which followed within half an hour. Among the prominent visitors were Lieutenant General P. H. Sheridan and Commissary General McFeely,  Mayor Roche and family,  Mr. and Mrs. Potter Palmer,  Charles Schwartz,  John Dupee,  Colonel Follansbee,  Mrs. General Bently,  the Misses Bently, Mrs. Randall, Miss Boisot, Evanston; Mrs. C. W. Wilkins, Mrs. C. Whitaker, Miss Bell, Milwaukee; Mrs. General Williams, the Misses Williams, Mrs. Moore, Mrs. Reid, Mr. and Mrs. C. B. Raymond.